"Let us remember that slavery was once a respectable business. When it was abolished the government established a £20m fund (40% of its annual expenditure) to compensate slave owners for the loss of assets. Slaves were not compensated. The bankers who hold the country to ransom today will one day be regarded with the same revulsion." Titus Alexander has been quietly active behind the scenes for over three decades, working both independently and with individuals in key ministerial and government positions. He is the author of several books, the heftiest of which is called, 'Unravelling Global Apartheid". Inspired by his visit to South Africa, when the regime changed he reassessed his argument and discovered a shocking truth that elevated the original proposal to something very much bigger: 'Apartheid' is not a local, South African, issue, it is global. Anyone can spot a difference based upon genetic inheritance, the true apartheid whose barriers criss-cross our world is far more insidiuous. Those who have, fear those who have not and will do everything in their power not only to exclude the 'Have Nots' but to increase their own wealth and power at the expense of those who already have less than they need to enjoy a moderate quality of life. Titus established the Self Esteem Network in the 1980s after discovering not only the importance of a healthy relationship with oneself but also realising how many people carry unnecessary (and fictitious) damaging self-perceptions. Who we are, who we think we are and what others think of us are all fluid, adaptable issues. The vicious circle of self-doubt is exacerbated by criticism while the benign spiral of self esteem is amplified by praise. Society's propensity for 'Schaden's Freude' (delight in the misfortunes of others, particularly those perceived to be successful) means the struggle for self esteem is disadvantaged from the outset. The Self Esteem Network was set up to overcome such obstacles and help people elevate themselves to their natural and rightful place - in their own eyes. Self belief automatically leads to belief in oneself by others. Each and every one of us enjoys a symbiotic relationship with our fellow human beings and that relationship begins with the way in which "I" - whoever "I" may happen to be - see "myself". As well as social and political interests, Titus has always been a natural playwrite and journalist at heart. His play, 'Dr Semelweiss', was performed by the Rudolf Steiner Theatre Group under the direction of the much loved director and English teacher, Mr Campbell. Dark and sombre, the play vividly portrayed the spectacular success achieved by Dr Semelweiss in overcoming the horrendous issue of death in childbirth through proper sterilisation. Titus is also a trained story teller and has written a number of children's fairy stories, purely for entertainment. Long before computers were even dreamed to be household items, before photo-copying and e-mail, Titus typed up a little magazine called 'Nature News' for distribution at school. Duplicated on a 'Banda' copying machine (which produced green or purple print) the 'magazine' enjoyed considerable success. One edition even included a photograph of an adder, Britain's only venemous snake, which had to be printed on photographic paper from 35mm film using an enlarger set up in the blacked-out bathroom. One of the brightest and most competent children in his class, Titus chose to study at the newly formed, somewhat radical university of Sussex immediately after successfully passing his 'A' levels. Before his first year had come to a close he realised that the transition from school to university is no light undertaking; university is not just, 'more school,' it is an entirely different kind of situation. For this reason, at least one year out 'in the real world' is a highly advisable step towards maximising the benefits one can gain from higher education. His short satirical magazine, 'K-no-w University' vividly illustrated the folly of haste vs experience. School children beware, 'tis better to spend at least one year away from any form of educational establishment, whether travelling rough or working in the local pub, than to leave school in July and start university or college at the end of the summer. While living and studying in Brighton Titus became involved both in a band and in local organisations fighting for social change. To this end he threw his weight behind a community centre that provided facilities to local people who otherwise would never have had the chance to develop their personal talents to their true potential. Sadly, the centre was destroyed by vandals, however, many of those who gathered there formed groups or societies which continued to thrive long after. 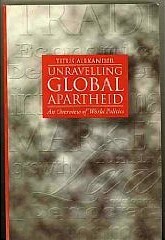 In the United States of America 'Unravelling Global Apartheid' has become a standard textbook in over a hundred universities. To see a complete list of publications and other activities see below.